There are plenty of Android users who feel that that they are missing an “all-in-one” synchronization desktop application to manage photos, videos, music and apps>Â You know, something like iTunes but with your data in the cloud a la Google.Â Dazzboard 2.0’s software, announced this week, looks to be exactly that. It is already available in Beta if you want to have a go, for now it will work only with Microsoft Windows with Internet Explorer and Firefox but a MAC OS X is planned. If your computer doesn’t have the requirements, you will be able to use a demo of the interface. 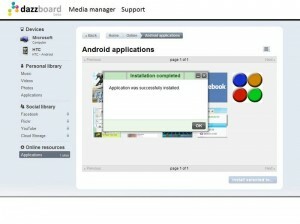 Android application manager: Install applications, Browse applications, Uninstall applications. Note: It is not clear at this stage if this is linked to the official Android Market or another Market. OpenID compatibility: Access Dazzboard with a Google, AOL, Yahoo! or MySpace account. 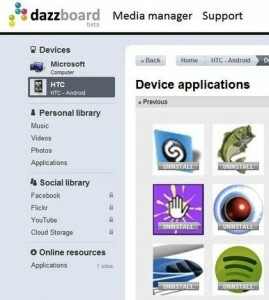 Enhanced media management for PC and Internet services, including cloud storage and social media networks. Easier to Manage Social Services: Browse your media on the social web as if it was on your PC, Faster photos and video transfers across the social web. Note: The demo features FaceBook, Flickr ad YouTube. Dazz me! : Create media links while browsing,Â Dazz me! 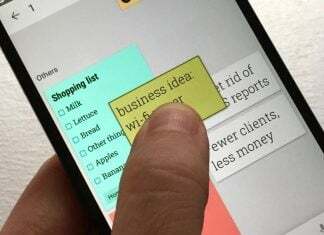 clicks become your Internet media bookmarks, Easily browse media bookmarks in Dazzboard, Get media from any site, including apps, images, music and video. Let’s hope that this product will deliver on its promises as it could become a great tools for many Android users.